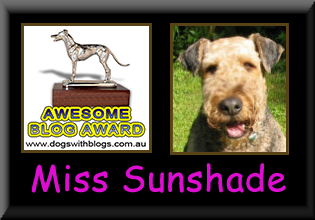 Life of Miss Sunshade - The Vancouver SuperDALE: The "other" treat machines - FIXED!!! The "other" treat machines - FIXED!!! Disclaimer: I, Miss Sunshade, the PERFECT SuperDALE was made to do this post. A while ago, I posted about my "other" treat machines. After that post, the general consensus amongst my readers were that those so called "treat machines" were BROKEN and that I should get a REFUND! Wait - we thought that's what we were supposed to do while hoomans were eating dindin and watching movies if popcorn might be involved! We think you're perfectly normal, Sunshade! What's up with the treat machine - We thought you said it was fixed??? No problems with the entertainment - works for us!!! Sure your "other" treat machine worked pretty well... for a while! Too bad it was fixed just for the video! That treat machine is most unreliable. Your furs look really great in the movie. You must spend hours getting your beardie just right. When I need food I dance and jump and whine and growl and bark. Perhaps you should start dancing? Merry X-mas EVERYONE & EVERYPUP! !